SolFocus, Inc. announced a deal with Moser Baer India Limited (BOM:517140), New Delhi, India, on Tuesday, October 10, 2006, for the volume manufacturing of SolFocus Gen1 Concentrator PhotoVoltaic modules. Moser Baer India (MBI) has invested $7 Million to close out the $32 Million Series A funding of SolFocus and will be the exclusive distributor of SolFocus modules in India and unspecified subcontinent countries. SolFocus has begun pilot production in a Sunnyvale, California, facility with 2MWp (Megawatt-peak) annual capacity. 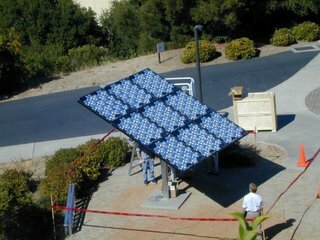 Over 4,000 250Wp SolFocus Gen1 modules totaling 1MWp will be produced at the Sunnyvale facility for performance, reliability, and field testing. SolFocus is considering other US sites for a major manufacturing facility to supply North American customers. MBI is expected to begin pilot production and field tests in 2007 and mass production in 2008. This is the second solar Concentrator PhotoVoltaic funding deal for MBI in the past month. Moser Baer India also invested in the $22 Million Series B Financing of Solaria Corporation along with Sigma Partners, NGEN Partners (a SolFocus investor as well), and Q-Cells AG (FRA:QCE). MBI’s wholly owned subsidiary, Moser Baer Photo Voltaic Limited, is establishing an 80 MW silicon PV manufacturing facility near New Delhi. 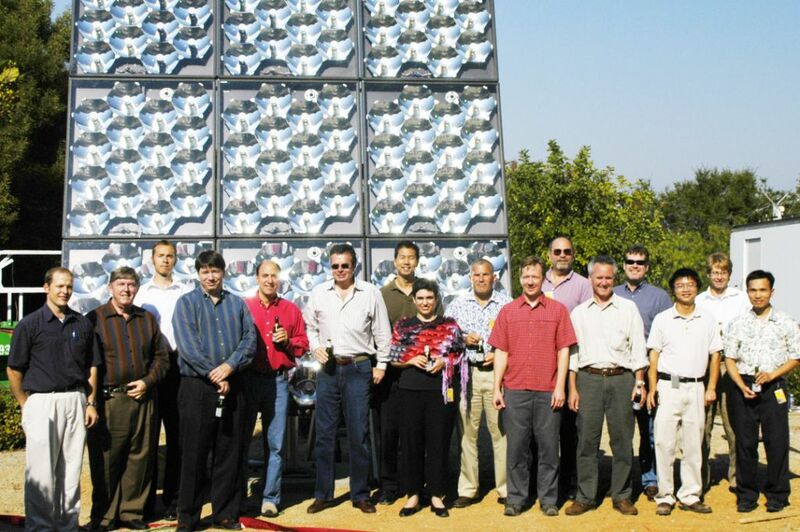 Most of the SolFocus Team and trackers with nine Gen1 modules each at PARC (Palo Alto Research Center). Photos courtesy of SolFocus, Inc.